Mauritius is an island located in the Indian Ocean near Reunion and Rodrigues islands. Clear warm colored blue turquoise water, and endless white beaches with coconut trees make Mauritius an ideal tropical dream beach holiday destination. Mauritius Island offers the visitors a large variety of beautiful white sandy beaches and blue lagoons. Mauritius is said to be the paradise of the Indian Ocean. Its large lagoons lined with fine white sand are the embodiment of paradise to those who want to enjoy the sea and the sun. All around the island, large strips of beaches offer unbeatable relaxing possibilities. The coastline of Mauritius is approximately 330 km long and nearly everywhere you can find the nice sandy beaches. Another big advantage of Mauritius is that the entire island is surrounded by coral reefs which have created big lagoons all around. These lagoons not only beautiful with crystal clear water, but also provide calm water conditions, ideal for swimming, bathing and snorkeling. On many of these beaches you are sure to find hotels and beach resorts. However it is important to know that all beaches of Mauritius are public. Most Mauritius public beaches are safe for bathing and swimming, and ideal for coastal walks and scenic sightseeing. Below you will find more information about the different beaches in each of the different coasts and regions of Mauritius. Mauritius is a tropical island and like many tropical islands it is lush green and has colorful vegetation throughout the year. The climate is very pleasant and allows the visitors to have perfect holidays all the year round. You can decide to come to Mauritius at any time of the year and you will be sure to have a comfortable weather during your stay. Please note that when visiting Mauritius during the summer period (November to April), you are sure to enjoy the bright sun and ideal swimming temperatures. During the period of July-September, the temperatures are lower and it can be a little cold for swimming and bathing in the sea. Special care should be taken while visiting beaches for swimming purposes. Few beaches are dangerous for bathing, while others can be too deep for children. This is why before entering the sea, make sure to keep track of any notice boards with warnings regarding entering the sea. Nudism is not allowed in Mauritius and there are no nudist beaches in Mauritius. It is important to know that all the beaches of Mauritius are public. This is also relevant for the hotel beaches. Accordingly, hotels, resorts or private villas owners can’t prevent you from entering “their” beach. The North is famous for the plenty activities on its beaches offering water sports such as waterskiing, windsurfing, sailing, deep sea fishing, and parasailing. In the evenings you will get to enjoy amazing views on the sunset, and also selection of trendy bars and restaurants situated with close proximity to the beach. Grand Bay, Pereybere, Cap Malheureux and Grand Gaube all offer beautiful beaches. Grand Bay is one of Mauritius most touristic villages with beautiful beaches and crystal clear lagoon. Also, Grand bay is famous for the many water activities available there or departing from its bay such as: water skiing, windsurfing, yachting, catamaran cruises, deep sea fishing and sailing trips. 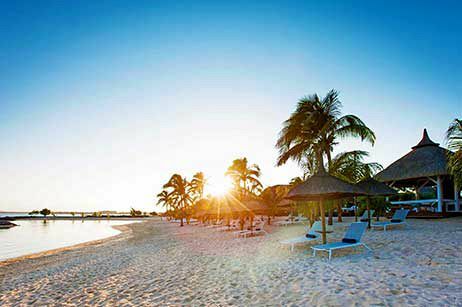 The most popular beaches of the North region of Mauritius are: Trou aux Biches, Mont Choisy, La Cuvette, Grand Bay Public Beach, Pereybere. The Trou aux Biches beach is located at the North West of Mauritius few kilometers South West of Grand Bay. Many refer to Trou aux Biches as the best beach in Mauritius considering the sand quality, weather conditions and available facilities along the beach. The beach is about 2km long, with white powder like sand. The beach is protected by the coral reef which in some parts almost reaches al the way to the beach. This makes Trou aux Biches also a great beach for snorkeling. Trou aux Biches beach is great for sunbathing, spending a day with the family as well as snorkeling and other kinds of sports activities. During the afternoon you are sure to have a spectacular view on Mauritian sunset. The beach is easily accessible as bus stations are situated right in front of it. The buses go from the beach all the way to Port Louis from one side, or Grand Bay the other side. The public beach of Mont Choisy is situated between Pointe aux Cannoniers and Mont Choisy about 4km south west of Grand Baie and a little north east of Trou aux Biches beach. The Mont Choisy beach is almost 3 kilometers in length with white sand bends around the coast creating a bay of beautiful turquoise water, lined with the casuarina trees which provide shade from the Mauritian summer sun. During the week the beach is quite empty and only few locals and tourists visit the beach. On the weekends the beach is busy with Mauritians who come to spend their weekend at the beach with their friends and families. This is why in case you are looking for a more quite and intimate beach atmosphere make sure to visit the beach during the weekdays and not during the weekends. Many sports activities such as jogging, aerobic and waterskiing are available along the beach. There is even a nice football field just beside the beach where you can join the locals for a friendly football game. The Mont Choisy beach is easily accessible by bus from Port Louis, Grand Baie and from all the other villages along the North West coast of Mauritius (such as Balaclava, Pointe aux Piments…). The Pereybere beach is located 2 kilometers east of Grand Baie and is easily accessible when driving from Grand Baie along the main coastal road heading east direction of Cap Malheureux. The Pereybere beach is very popular with both locals and tourists staying in Pereybere or in the neighboring Grand Baie. Because the water at the lagoon is quite deep and crystal clear, it makes for great snorkeling. Pereybere beach is full of life with fast food stalls scattered along the beach selling kebab, sandwiches and also fresh pineapple. Also, few meters from the beach you will find many bars and restaurants serving Chinese, Mauritian and International cuisine. The public beach of La Cuvette is very close to the center of Grand Bay. The beach is situated near the Royal Palm hotel and you can reach it when heading from Grand Bay center to Pereybere. The beach is quite small and intimate. The water is very calm and the beach is clear of rocks and corals. It is very nice to walk from the beach along the coast until reaching the center of Grand Bay. The Grand Bay public beach is situated at the very center of Grand Bay and it is impossible to miss. Due to the very active boat and catamaran traffic inside the bay, the public beach has only a small area in which you can enter the water. Although there is no doubt the beach is very nice and provides great view of both Grand Bay and the beautiful bay, you should take into account that due to all the boat traffic inside the bay, the water is probably not as clear as in the other beaches. The Grand Bay public beach is easily accessible by walk from anywhere in Grand Bay and you enjoy range of facilities offered on and along side the beach such as fresh juice stands, fast food stalls, beach restaurants and many more. East is wilder and less developed than other parts of Mauritius and is offering a spectacle view of wild nature. The white beaches of Blue Bay, Palmar and Belle Mare stretch endlessly along the coast, fringed on one side by the shady green casuarinas trees and edged by the lagoon on the other side. Along the east coast the beaches are more virgin with less beach facilities and are also less crowded than the beaches at the North of the Island. The most popular beaches of the East region of Mauritius are: Blue Bay, Belle Mare and the beaches of the Ile aux Cerfs Island. The Blue Bay beach is situated at the South East of Mauritius not far from the port city of Mahebourg. This is one of those beaches where it is simply hard to get a bad picture. The contrasts are amazing. Once you reach Blue Bay beach, you will realize where the name comes from. The sea is crystal clear with many different blues shinning from any angle. Blue Bay Beach can get quite crowded on weekends with locals heading from Mahebourg to enjoy some relaxation on this beautiful beach. During the week, the beach is quite empty and you will have this beautiful beach almost for yourself. The beach is perfectly suited for swimming and relaxing. It is also possible to enjoy a very nice stroll along the beach seeing small beautiful bays away from the public. Blue Bay is also very famous for the Blue Bay marine park which is the first and biggest marine park in Mauritius. Blue Bay Marine Park is an ideal destination for snorkeling trips. The Blue Bay Beach is easily accessible from Mahebourg. You can take a direct bus to the beach or use a local taxi for the short drive. The Belle Mare beach is one of the most beautiful beaches of Mauritius. The Belle Mare is one of the longest if not the longest beach of Mauritius. The beach starts at Belle Mare village and stretched all the way south till the village of Trou dÈau Douce. It’s known for calm waters as there is a great deep lagoon that runs between the shoreline and the beach. The Belle Mare beach sand is very white and pristine. Because of its length the beach of Belle Mare is perfectly suited for sport activities like jogging and walking along. The walking along this beautiful beach is a real treat. The Belle Mare beach is also famous for its unique combination of colors. The turquoise deep blue lagoon ends, changes to turquoise crystal clear water in the beach area and ends up in a white clean beach which is bordered to lush green grassland covered by many trees and plants. This Belle Mare beach lies vacant for most of the week. During weekends the Belle Mare beach fills up with many locals from the surrounding villages. Just off the east coast of Mauritius and easily accessible from Mauritius mainland by boats, situated the paradise island of Ile aux Cerfs. 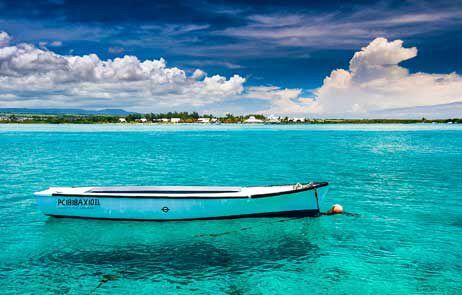 The Ile aux Cerfs Island is located inside the large east coast lagoon and as such it benefits the calm waters of the lagoon and the beautiful crystal clear colors. As you approach the island by boat, you will see the swaying palm trees and the pure white beaches framed by the vivid turquoise waters of the lagoon. When visiting Ile aux Cerfs you should better dedicate a full day for spending on the island enjoying the many facilities and excursions offered on it. Ile aux Cerfs Beach has full facilities for the benefit of its visitors. There are restaurants that cater to almost every palate, local bazaar, water sports kiosk and of course the beautiful Ile aux Cerfs beach which surrounds the entire Island. Ile aux Cerfs, as one of the most popular tourist destination in Mauritius, is pretty busy with tourists throughout the week. The south of Mauritius is considered to be a more virgin region of the Island providing wilder scenery. The south of the Island is also known for its high sea cliffs and for the dramatic sights of the big waves crushing against the rocks. The reason for the big waves is the breaks in the coral reef at that area which allow the waves to reach all the way to the coast. This makes the sight of Mauritius south coastline very dramatic and picturesque. The beaches on the Southern part of the island are not recommended for swimming. Usually the area is made up of quite high cliffs which most of the time directly fall into in the sea. Also, due to the fact the island is not protected at this area by the reef, the sea currents are very strong and can be dangerous. The most popular beaches of the South region of Mauritius are: St Félix, Riviere des Galets and Gris Gris. The Riviere des Galets beach is located between Souillac and Bel Ombre. The beach is easily accessible when driving on the coast road heading east from Souillac. 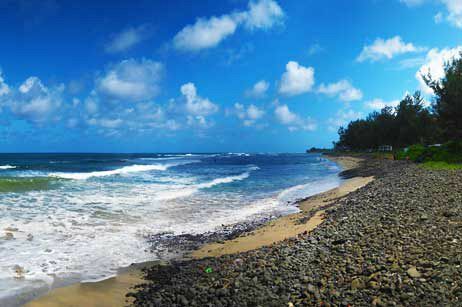 Riviere des Galets beach is a great place to enjoy a great view of the sea and the big waves crashing on the shore. Here you can smell the sea, feel the wind breeze and enjoy a beautiful view of the south mountain range. Few minutes walk from the beach found the small island Ilôt Sancho. The island is reachable by walk from the beach of the Riviere des Gallet by crossing the very shallow sea on this spot. Ilôt Sancho itself is very small and it is possible to do a complete circle of the island in several minutes. The walk on the island is quite nice, and you will have a great view on the south coast. The sea at Ilôt Sancho does not suit swimming. The beach of St. Felix is located at the very south of the Island between the towns of Belle Ombre and Soulliac. The St. Felix is considered one of the most beautiful beaches of the south of Mauritius, right after the Le Morne peninsula. The St Felix Beach has two small separated beaches of which the more eastern beach is recommended to visit. The beach itself is very beautiful, the sand is white and the sea offers mixtures of blues, from a light turquoise to a darker blue. The many trees and greenery along the coastline provide a dramatic contrast to the beach and sea. Swimming and bathing is not possible at St Felix due to the strong sea currents and the many corals scattered along the beach. The beach is very quiet during weekdays and it offers ideal and relaxed gateways. The Gris Gris beach is located in the South of Mauritius, a few kilometers southeast of the village of Souillac. When driving on the coast road heading east from Souillac you will see a sign leading to the beach of Gris Gris. Gris Gris beach offers the visitors a magnificent view from the top of its cliffs. This part of the island is not surrounded by coral reefs which causes the large waves crash directly on the cliffs creating big splashes of water. Beside the beach there is a small garden offering many quiet spots for you to relax on one of the many benches, while having a view of the sea, waves and rock cliffs. From the garden there is a path which leads to a small beach where you can admire the view of the sea up close. The most spectacular part of Gris Gris is the "Roche Qui Pleure" where the constant crashing of waves against the flanks of the cliff gives the impression that the cliff is crying. Enjoy beautiful beaches and magnificent sunsets along the West coast of Mauritius. Flic en Flac one of the most popular beaches of the western side of the island offers a blue turquoise lagoon with shallow water. 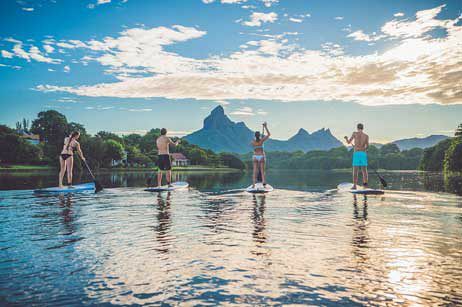 The Tamarin and Le Morne beaches are well known in Mauritius and also worldwide as ideal destinations for surfers where the waves and wind conditions provide ideal conditions for surfing. The west coast beaches are quite popular with both tourists and the local Mauritian population. 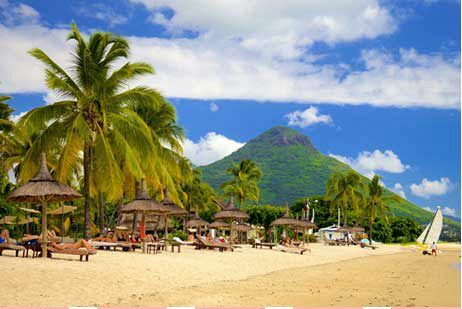 The most popular beaches of the West region of Mauritius are: Flic en Flac, Tamarin and Le Morne. The beach of Flic en Flac is located on the west coast of Mauritius between the village of Albion and Tamarin. The Flic en Flac beach (which means “Free and Flat Land” in Dutch) is one of the longest beaches of Mauritius. The beach continues almost all the way to the village of Tamarin and as such is ideal for a great 1 hour beach walk. The beach is great for bathing, swimming, snorkeling and for spending a day of relaxation with your partner, family and friends. The beach of Flic en Flac has white sand and a turquoise blue lagoon. The beach is entirely protected by the coral reef and offers best swimming possibilities without strong sea currents. When entering the sea be aware of the corals and especially of the sea urchin which are very common in this area. Stepping on a sea urchin can be very painful and this is why it is highly recommended to wear sandals or swimming shoes when entering the sea. The highlights of Flic en Flac are the beautiful sunsets which fill the sky with range of colors. The sight of the sun disappearing in the sea with the remarkable scenery of the beach all around is quite breathtaking. During weekdays the beach of Flic en Flac is quite empty while in the weekends the beach can become quite busy with many locals from the surrounding villages and towns. The Tamarin Beach is situated at the bay of Tamarin between Flic en Flac and the village of Black River. The sight of the Tamarin beach including also the Tamarain bay and the Black River mountain range in the background is quite impressive and makes a visit to the beach worthwhile. The sand of the Tamarin bay is yellowish and consists of soft sand mixed with little stones. The sea in this area is clear from corals, stones and sea urchins. The river of Tamarin cuts the beach in two parts. You can pass from one part to the other by crossing the river by foot. Furthermore, the Tamarin bay has no coral reef protecting most of it, so on many occasions when the sea is rough outside the reef, the bay’s waters are also rough. It is worth noting that the lack of reef protection may lead to strong sea currents and rough seas, so caution should be exercised when entering the water. Nevertheless, the Tamarin Bay is famous among surfers as the medium waves (about 1 metre) are suitable for surfing and bodyboarding. The bay is also great for bathing in the shallow waters. The Tamarin Beach is quite empty during the week while during the weekends many locals come to the beach with their families. On Friday and Saturday night, it is very popular to come and set-up a campfire along the beach and the Tamarin bay. The Le Morne peninsula is situated on the south west tip of Mauritius. The beaches of Le Morne are located on the west part of the Le Morne peninsula on the foot of the Le Morne Brabant. The public beach of Le Morne is a beautiful beach with white coral sand, very clear waters providing great visibility, trees scattered along the beach, and beautiful scenery with the Le Morne Mountain as an impressive background. Despite many of the Le Morne beaches now being the setting of top class hotels, the public beach of Le Morne is easily accessible from the main road and is on the same level as the other beaches in the area. The Le Morne beach is particularly popular for wind and kite surfers. The perfect wind conditions almost all year-round makes this beach one of the top kite and windsurfing destinations in the world. Also for all non-surfers, it is worth making a trip to the beach to watch the professional surfers. Swimming at this beach is possible however, you should be aware of all the surfers and kitesurfers gliding and surfing along the beach. 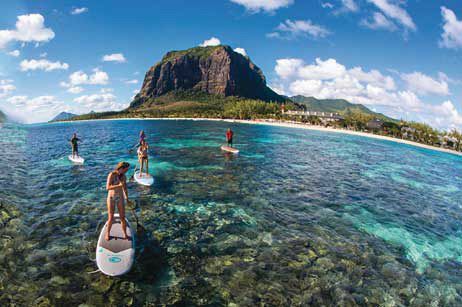 During any day of the week, the Le Morne beach may be quite busy, depending on the surfing conditions on the day. During weekends, the beach is busy with both locals and tourists coming to enjoy this beautiful beach, the ideal surfing conditions or watching the amazing surfing skills of the professional surfers visiting the beach.